Spork Bytes is a Portland-based company that provides planning, delivery, and setup of catered meals to your office from top local restaurants. In business since 2014, their well-defined business processes were starting to be cumbersome given their growth. In order to keep from inhibiting that growth, they reached out to us to build them a web application to handle many of their operations. To grow a business requires ever increasing efficiency and in the case of Spork Bytes, efficiency meant consolidating and digitizing their manual business processes. When we had our first meeting, I observed Chris, one of the co-founders, plan a meal; it took him 15 minutes. The process included editing multiple Excel spreadsheets, showing and hiding columns and rows depending on the audience, exporting the spreadsheets to PDFs, using an online service to merge those PDFs, and then emailing those PDFs. I told Chris that with a properly designed web app, we could get that time down to 1-2 minutes. 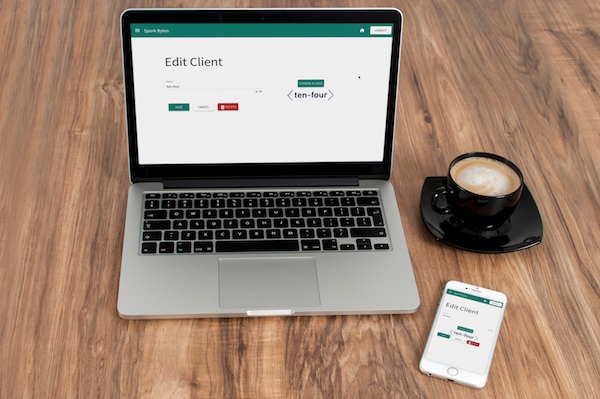 The first step was to build a client and partner management system, a single source of truth for all metadata of the offices and restaurants that Spork Bytes worked with. This would then form the basis for creating all future meals, thereby reducing mistakes because much less was done through manual typing. With the client and partner management system in place, the meat of the application was ready to be built: meal planning. We needed to build the app to be flexible enough to allow for the many different scenarios Spork had to deal with, but had to make it structured enough to have a well-defined process that was easy to follow for Spork employees, clients, and partners alike. Working with ten-four has helped us uncover ways to improve our efficiency as a business as a whole. Having already planned over 1,000 meals before we began developing the app, Spork had a fairly well defined process for planning meals. They would put together one or more meal options per meal proposal, send that to the client via email, get an approval from them for one of the meal options, and send the meal option to the partner restaurant(s) for approval. After everyone had approved the meal, it would then be confirmed 24-48 hours before the date of delivery. Assuming everything was confirmed, the meal would be delivered by one of Spork's delivery drivers. With the requirements set, we started development, meeting weekly to ensure that what we were building matched Spork's expectations. Every week saw increases in functionality until we were finally ready to start testing in the wild. 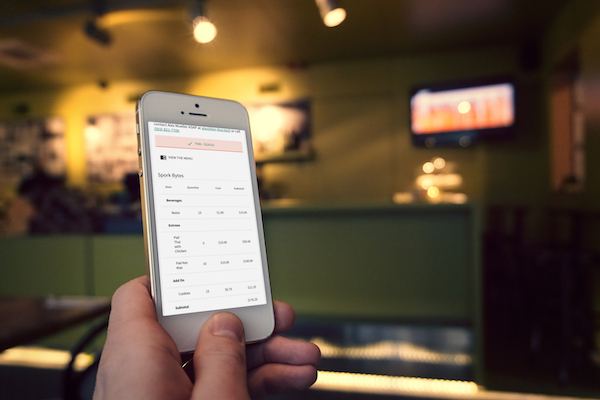 The app has streamlined, simplified, and automated our business processes more than I could have ever imagined. Beta testing began with a small handful of Spork's clients and feedback was instantly very positive; the new process was simpler for everyone. Spork employees could plan a meal in a couple minutes and send out approval request emails with the push of a button. Clients and partners could approve meals directly within the app and if they had questions, they could simply reply to the email sent by the app to directly contact Spork. 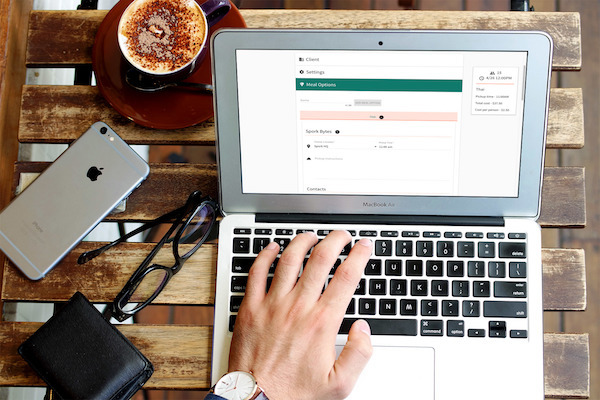 No more editing of Excel spreadsheets, exporting and merging PDFs, and manually attaching documents to emails. In addition, we have a huge list of ideas that we continue to work on. The goals with Spork's web app were to improve their efficiency and foster growth, both of which have been achieved. With our ongoing development efforts, Spork's business will have a strong technical foundation on which to build the next phase of their growth. Have a website or web application that needs to be built or enhanced?